This gadget is called ZScanner 700 and it uses lasers and dual cameras to digitize any object you point at into a 3D polygon mesh within minutes. Just attach the included reflective markers to the object and connect the ZScanner 700 to any notebook via FireWire and you’re good to go. The image is drawn on your notebook in real time. 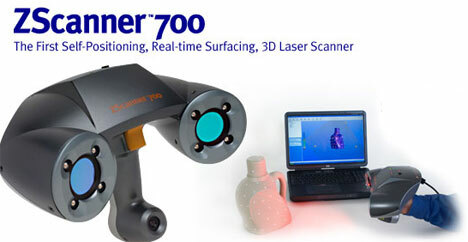 ZScanner 700 costs a $39,000.